Challenge: Install a 6.65-by-146.5 foot mural composed of more than 700 10-by-20 inch porcelain tiles with glass relief elements in the carriageway at the St. Paul Union Depot. This public installation, which visually captures the excitement of traveling by train, must withstand harsh Minnesota winters. 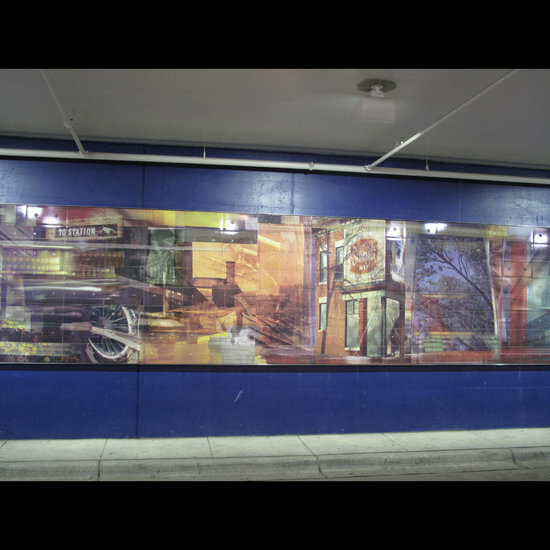 Surface Prep: TEC® Roll-On Crack Isolation Membrane forms a uniform surface over the mural’s cement board substrate. Crack isolation was an important factor in the carriageway, since Minnesota’s freeze/thaw climate could cause the substrate to expand and contract. Grout: For this exterior installation, installer Jan Hohn, of Hohn & Hohn, Inc., relied on InColor™ Advanced Performance Grout for its high-strength, crack- and shrink-resistant formula. The products also offers stain resistance without sealing and defends against mold and mildew. Contractor De-Brief: “Once I decided to use InColor™ grout, it was an easy choice to use all TEC® product for this project and of course, receive, the warranty that the TEC® system provides. InColor™ grout was easy to work with, allowing us to finish grouting in one day.” — Jan Hohn of Hohn & Hohn, Inc.
For more ideas on how to address projects, like this one, that encounter freeze-thaw conditions, read this blog post: "selecting a tile installation system for cold weather".